A disco track is second on this list because – Rock Hall of Fame shenanigans notwithstanding – disco is almost universally beloved. If you’re a wedding DJ in a tricky spot, the late 70s will not let you down. Perhaps that was truer in 2004, when we compiled the list, than 2014, but even so a Whig History of Pop – one in which the aim is to create a sense of progress to the present day – might as well start with disco. This stuff is foundational. 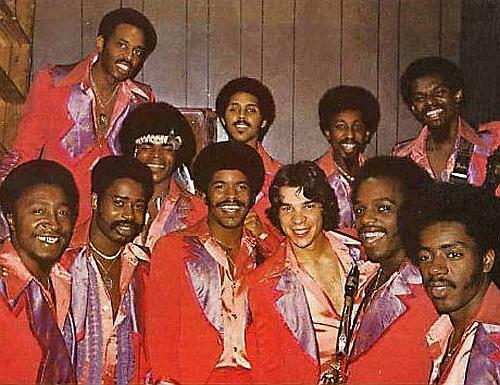 The intuition of disco’s discontents – like the Comiskey Park crowd who took the Trammps’ chorus on “Disco Inferno” as an order – was that disco was a break point, the end of something they had loved and the beginning of something they would not. This intuition was not entirely wrong. If “Get Lucky” is an indication, the more intricate, light-touch end of disco is more fashionable now than the uproarious, full-fat version that “Disco Inferno” represents. “Disco Inferno” is tacky, it smells of cheap drink deals and sticky floors. But it got that way because it’s barely deniable. The delighted, destructive frenzy of the song – the punch of the horns, Jimmy Ellis’ devilish growl – is violently inclusive: if we’re going to burn, we will all burn together. Disco may be the dawn of pop these days, but there is always deeper magic, other layers to excavate; unrest – in this case – both theatrical and real. The panicky bass and string parts on “Disco Inferno” call up The Crazy World Of Arthur Brown; the chant is lifted directly from 60s DJ Magnificent Montague, via the Watts riots. But this is what pop does – assembles coincidences, ideas and images, spins them into a moment, leaves writers to catch up and piece it all into a story. And stories tend to hide the more down to earth angles. Jimmy Ellis was 38, a working class, southern black guy, a former meatpacker with a big voice who’d spent the 60s as a jobbing vocalist before getting the Trammps together in his early 30s. Did he love disco? No, he was an R&B singer. Were the glitzy red suits – and the uniform dungarees before them – his idea of style? Who knows. They worked. The stories of the disco groups – soul and R&B men who saw a shot and took it – remind me of other 70s realists, a continent away from the Trammps. The glam rockers: old school, working class, rock and rollers and one-shot psych bands who dressed up to become Slade, the Sweet, Alvin Stardust. Pop history flatters itself and its fans by emphasising the self-actualisers, the people who, through music, become what they always were inside. But there is a more pragmatic element – never better seen than in the 70s – and we romance it away at our peril: let the wham of “Disco Inferno” serve as today’s reminder. Funny, I was just thinking about modern pop’s Year Zero when reading about the Kanye/Macca thing last week: if The Beatles have slid, as you’ve suggested, into a Duke Ellington/Louis Armstrong sort of role (respected by those who know their musical history but too distant, temporally or stylistically, to be considered a relevant reference point for the here and now of pop or for your average pop fan to know much about them) then where does the cut-off point lie? Thriller, I wondered? Or disco at a pinch. Though, as you say, it seems to be the clipped disco-funk of Chic that’s casting the longest shadow at the moment.